HW heavy weight cotton canvas. Durable heavy duty construction. Giant main compartment with 12 tool pouches. Heavy duty nylon zipper. 2 snap-closed outside compartments. Hard bottom. Outside pouch pockets is ideal for storing small components. Tough canvas web carry handles for easy transport of bag. Main compartment has a zipper closure. 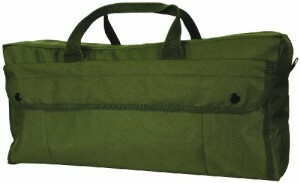 Jumbo size tool bag to fit those tools that need extra space. Jumbo mechanics tool bag. Dimensions: 17.5″ x 9.5″ x 6.5″ (inches).